This article is about the year 1869. For other uses, see 1869 (disambiguation). 1869 (MDCCCLXIX) was a common year starting on Friday of the Gregorian calendar and a common year starting on Wednesday of the Julian calendar, the 1869th year of the Common Era (CE) and Anno Domini (AD) designations, the 869th year of the 2nd millennium, the 69th year of the 19th century, and the 10th and last year of the 1860s decade. As of the start of 1869, the Gregorian calendar was 12 days ahead of the Julian calendar, which remained in localized use until 1923. Wikimedia Commons has media related to 1869. January 3 – Abdur Rahman Khan is defeated at Tinah Khan, and exiled from Afghanistan. January 5 – Scotland's oldest professional football team, Kilmarnock F.C., is founded. January 27 – The Republic of Ezo is proclaimed on the northern Japanese island of Ezo (which will be renamed Hokkaidō on September 20) by remaining adherents to the Tokugawa shogunate. February 5 – Prospectors in Moliagul, Victoria, Australia, discover the largest alluvial gold nugget ever found, known as the "Welcome Stranger". February 20 – Ranavalona II, the Merina Queen of Madagascar, is baptized. February 25 – the Iron and Steel Institute is formed in London. February 26 – Mahbub Ali Khan, 2½, begins a 42-year reign as Nizam of Hyderabad. March – In Japan, the daimyōs of the Tosa, Hizen, Satsuma and Chōshū Domains are persuaded to return their domains to the Emperor Meiji, leading to creation of a fully centralized government in the country. March 1 – The North German Confederation issues 10gr and 30gr value stamps, printed on goldbeater's skin. March 1 (O. S. February 17) – Dmitri Mendeleev finishes his design of the first periodic table and sends it for publishing. March 4 – Ulysses S. Grant is sworn in, as the 18th President of the United States. March 9 – Southern Illinois University Carbondale is founded. March 18 (O. S. March 6) – Dmitri Mendeleev makes a formal presentation of his periodic table to the Russian Chemical Society. March 24 – Titokowaru's War ends with the surrender of the last Māori troops at large, in the South Taranaki District of New Zealand's North Island. April 6 – The American Museum of Natural History is founded in New York. April 17 – The State of Morelos was created in Mexico. May – In France, the opposition, consisting of republicans, monarchists and liberals, polls almost 45% of the vote in national elections. May 4–10 – Naval Battle of Hakodate: The Imperial Japanese Navy defeats adherents of the Tokugawa shogunate. 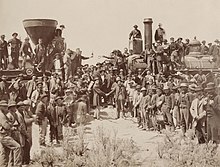 May 10 – The First Transcontinental Railroad in North America is completed at Promontory, Utah, by the driving of the "golden spike". May 15 – Women's suffrage: In New York, Susan B. Anthony and Elizabeth Cady Stanton form the National Woman Suffrage Association. May 18 – One day after surrendering at the land Battle of Hakodate (begun 4 December 1868), Enomoto Takeaki turns over Goryōkaku to Japanese forces, signaling the collapse of the Republic of Ezo. May 22 – Sainsbury's first store, in Drury Lane, London, is opened. May 24 – John Wesley Powell departs Green River WY, with a company of 9 other men, on a trip down the Green and Colorado Rivers. June 1 – The Cincinnati Red Stockings open the baseball season as the first fully professional team. June 2 – Sherwood College is founded in Nainital, India. June 15 – John Wesley Hyatt patents celluloid, in Albany, New York. June 27 – The fortress of Goryōkaku is turned over to Imperial Japanese forces, bringing an end to the Republic of Ezo, the Battle of Hakodate and the Boshin War. June 30–July 2 – The first Estonian Song Festival takes place in Tartu. July 10 – Gävle, Sweden is destroyed in a city fire; 8,000 people become homeless. July 26 – The Irish Church Act 1869 is given royal assent by Queen Victoria, disestablishing the Church of Ireland effective January 1, 1871. August 9 – August Bebel and Wilhelm Liebknecht found the Social Democratic Workers' Party of Germany (SDAP). August 27 – The University of Oxford wins the first international boat race held on the River Thames, against Harvard University. August 31 – Irish scientist Mary Ward is killed by a steam car. September 5 – The foundation stone is laid for Neuschwanstein Castle in Bavaria (southern Germany). September 11 – Work on the Wallace Monument is completed in Stirling, Scotland. September 12–13 – The P&O's SS Carnatic runs aground and sinks in the Red Sea; 31 drown. September 24 – Black Friday: The Fisk–Gould Scandal causes a financial panic in the United States. October 8 – Austria-Hungary sends reinforcements to battle the uprising in Krivošije. October 11 – The Red River Rebellion breaks out, against British forces in Canada. October 16 – England's first residential university-level women's college, the College for Women (predecessor of Girton College, Cambridge), is founded at Hitchin, by Emily Davies and Barbara Bodichon. November 4 – The first issue of the scientific journal Nature is published in London, edited by Norman Lockyer. November 6 – The first game of American football between two American colleges is played. Rutgers University defeats Princeton University 6–4, in a forerunner to American football and College football. November 17 – In Egypt, the Suez Canal, linking the Mediterranean Sea with the Red Sea, is inaugurated in an elaborate ceremony. November 19 – The Hudson's Bay Company surrenders its claim to Rupert's Land in Canada, under its letters patent, back to the British Crown. November 23 – In Dumbarton, Scotland, the clipper ship Cutty Sark is launched (it is one of the last clippers built, and the only one to survive into the 21st century). December – Leo Tolstoy's novel War and Peace is published in complete book form, in Russia. December 7 – American outlaw Jesse James commits his first confirmed bank robbery, in Gallatin, Missouri. December 8 – The First Vatican Council opens in Rome. December 10 – The first American chapter of Kappa Sigma is founded, at the University of Virginia. December 10 – Women's suffrage: The Wyoming territorial legislature gives women the right to vote, the first such law in the world. December 31 – Paraguayan War: Triple Alliance forces take Asunción. Basutoland becomes a British protectorate (abolished in 1966). The capital of the Isle of Man moves from Castletown to Douglas. Arabella Mansfield became the first woman in the United States awarded a license to practice law, at Mount Pleasant, Iowa. James Gordon Bennett, Jr. of the New York Herald asks Henry Morton Stanley to find Dr. David Livingstone. The Co-operative Central Board (later Co-operatives UK) is founded in Manchester, England. Friedrich Miescher discovers deoxyribonucleic acid (DNA). The Ladies National Association for the Repeal of the Contagious Diseases Acts is founded, in Great Britain. French missionary and naturalist Père Armand David receives the skin of a giant panda from a hunter, the first time this species becomes known to a Westerner; he also first describes a specimen of the "pocket handkerchief tree", which will be named in his honor as Davidia involucrata. In France, Hippolyte Mège-Mouriès patents margarine. The University of Otago is founded, making it New Zealand's oldest university. Glasgow University Rugby Football Club is founded in Scotland. ^ "Ceremony at "Wedding of the Rails," May 10, 1869, at Promontory Point, Utah". World Digital Library. May 10, 1869. Retrieved July 20, 2013. ^ Baren, Maurice (1996). How it All Began Up the High Street. London: Michael O'Mara Books. ISBN 1-85479-667-4. ^ a b Palmer, Alan; Veronica (1992). The Chronology of British History. London: Century Ltd. pp. 290–291. ISBN 0-7126-5616-2. ^ "Giant Panda". Encyclopædia Britannica Online. 2010. Retrieved August 9, 2010.